In which we observe a talented and charismatic woman gradually descend into alcoholism and mental illness, culminating in her skinny corpse being wheeled into the back of a van. This is the story of Amy Winehouse, as told by Senna director Asif Kapadia. The magnificent Senna (maybe the greatest biographical documentary ever) ended with its subject dying in mangled wreckage. 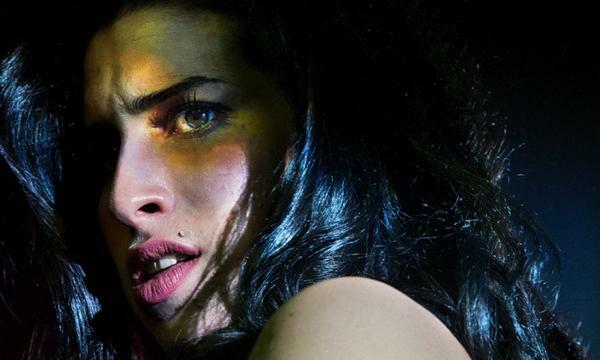 Amy ends in much the same way, surrounded by the final shreds of her talent, dignity and sanity. It's easy to forget just how quickly and brightly Amy Winehouse burned. The release of Back to Black in 2006 made her an immediate icon, her tattoos, beehive hairdo, Camden-style , confessional lyrics and that voice defining her as something new, propelling her to fame and wealth beyond her wildest dreams. Five short years later she was dead. Working almost entirely from archive footage, Amy traces the singers teenage musical beginnings, ascent through the music industry and eventual drugged out stupor. It's an incredibly bleak film; every pre-fame image of the young, smiling and vivacious artist tainted by our knowledge of what's to come. Leaving aside the emotion for a moment, it should be emphasised what an outstanding researcher and editor Kapadia is. God only knows how many hours of footage he must have trawled through to construct this film, piecing together a narrative from thousands of disconnected video clips from many different sources. It impresses upon you how thoroughly a contemporary life can be documented; a mosaic assembled from cameraphones, news reports, television shows and family videos. Context comes from contemporary interviews with key figures in her life. Cleverly Kapadia doesn't use the bog-standard 'talking heads' style, preferring to overlay the interviews onto relevant footage. This draws up a gentle documentary tension; in the interviews with figures the film treats critically, what they're saying and what we're seeing don't quite add up. The overall effect is that, by the time the credits are rolling (with new footage still playing over them), we feel as if we've genuinely gotten to know Amy Winehouse. This is, of course, an illusion. How can you truly understand someone through two hours of edited clips? But it's an effective illusion, Kapadia manipulating our perceptions of his subject in order to subtly communicate his message. This proves to be a critique on the exploitation of talent, laying out who 'used' Winehouse and why. But it's less a process of identifying and condemning 'villains' and more a critique on the processes that allowed them to behave in the way they did. For example her father, Mitch Winehouse, doesn't come out of this looking especially amazing, but he's more stupid than malicious. Another potential villain, her ex-husband Blake Fielder winds up as just another victim - a mirror of Amy Winehouse minus both talent and charisma. The real villain of the piece soon rears its head; a voracious media fuelled by you and I. There's a epilepsy warning before the film that proves entirely warranted when the paparazzi swing into action, jostling the increasingly confused looking singer in a nightmare strobe world of flashes and screaming. If this is what life is public is like, no wonder so many celebrities go bananas. Kapadia reserves most of his venom for the media, condemning the comedians that made light of her condition, the salacious news reports that wallowed in her misery and the intrusive cameramen that jammed lenses in every private moment. Paradoxically, Kapadia is quite happy to use that stolen footage in his film. In an affecting moment we see a paranoid-looking Winehouse staring through the slats of her bedroom window, shot through a telephoto lens. It's faintly hypocritical to condemn the tabloids then use their footage, but it's hypocrisy with a point. In watching Amy you feel an extreme empathy with her, as if you're on the same side. Yet, in effect, by delving through a jigsaw puzzle of her private moments you're engaging in precisely the same behaviour that drove her to an early death. By the time we see her body laying under a blanket you should ask yourself exactly what you're getting out of this. "Aw, what a sad story" sentimentality? Smugness in watching someone successful fail? The vicarious thrill of watching a hedonist burn out? We all try to fit Amy Winehouse's biography into a preordained narrative, scratching away at reality until she's less a human being and more a romanticised archetype. I can't deny Amy's quality: the music is amazing, the subject is fascinating and Kapadia's technique is second-to-none. But the process of watching the film turns us into vultures, greedily stripping the last chunks of meat off her mouldering carcass. Clearly no lessons have been learned from this whole affair; presumably the next talented and troubled hot young musician that comes along will suffer much the same miserable fate. It's for that reason that I found Amy such a profoundly sad experience.